New from Vancouver studio Switch United is an interactive companion feature for Paperny Entertainment‘s Cold Water Cowboys, returning to Discovery for Season 2 on March 10th. Atlantic Empire is an immersive multiplayer HTML5 gaming experience that captures the essence of a high-stakes Newfoundland fishing adventure with a combination of both strategy and skill-based gameplay, including in-depth information about show characters and locations. Using map-based gameplay, players customize their harbours and their fishing operations, reaping as much crab, herring and mackerel as they can in order to build their fishing dynasty. 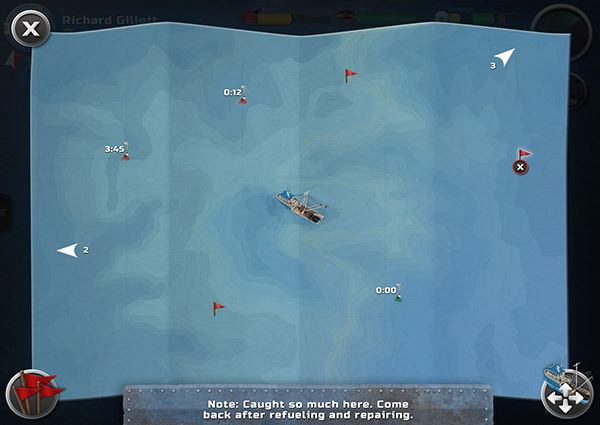 Cold Water Cowboys Atlantic Empire is a fishing strategy game. The object is to explore the oceans looking for fish and crab. By placing crab pots and catching herring and mackerel you can earn big bucks which can be used to upgrade buildings and equipment to accommodate the growth of your fishing empire. Watch for icebergs and whales when you explore the high seas – too much damage and you’ll have to return to your port and pay for repairs. Completing challenges allows you to ‘level up,’ which unlocks upgrades to your boats, net, and buildings. Before you know it, you will be at the top of the Leaderboard as the true King (or Queen) of the Atlantic. Game play does require registration, which players can do using either their email or Facebook accounts. Once registered, players can choose a flag, boat colour and home port. The port you choose will determine the captain that will lead you through the tutorial. Each port has a video that introduces the crew and port that you can view before making your choice. After collecting one crab pot and catching fish, you will need to go to your home port and place your buildings. Anytime you need to return to your port you can click on the ‘port button’ that appears in the bottom left of the screen when you are out at sea. Once back at port, you can begin to set up your buildings. You can place your buildings anywhere you choose, as long as their footprints don’t overlap one another as they need room to ‘grow’ in the future. Once all of your buildings are placed, it is time to process your first catch. By clicking on the ‘Fish Plant’ you will see the option to ‘process catch.’ The value of the catch will be added to your bank at the top left of the screen. The game’s elements include Game Views and the User Interface. Sea Screen – This is the main navigation aspect of the game. Here you can move your boat around to search for prime fishing spots, places to drop your crab pots, and locate other players’ crab pots to steal! To move your boat, simply click on any area of the ocean and the boat will move to the spot you clicked. From this screen you will also have access to your sonar, which indicates which spots have fish and which are bare. Additionally, this view allows you to see other players in real time as they play the game at the same time as you. Keep an eye out for unguarded crab pots – these can be stolen, increasing your bankroll. Fishing Screen – Once you choose to start fishing, you will be taken to the fishing screen. Click a spot on the ocean to move your skiff out from the back of the boat, circling the fish, and return to your main boat before you run out of net. Watch out for icebergs (they cause damage to your net) and whales (don’t want to be fined) to get the maximum cash from your efforts. Map Screen – The Map Screen indicates where you have placed your crab pots. You can also add notes to remind you where those great fishing spots are so you can return and fish them again. Port Screen – Here you can access all of your buildings to perform tasks such as processing fish, repairing damaged equipment, performing upgrades, and refueling. Click on each building to see which upgrades are available and the costs associated with each. Port Button – brings you back to your home port to refuel, process fish, do repairs, etc. Map Button – brings you to the map screen where you see the location of your crab pots and any notes you might have left. Sea Button – brings you back to the Sea Screen from the Port Screen or Fishing Screen. Level Indicator – indicates current level of the player. Challenge Flags – indicates the number of challenges completed at the current level. All three challenges must be completed in order to increase your level. Bank – indicates how much money a player currently has. Side menu tab – clicking on this reveals the side menu, which provides information on individual and team challenges, plus links to leaderboards, Facebook sharing, and logout. Fuel Meter – indicates the amount of fuel the player’s boat currently has. Meter will change from green to yellow to red as players burn fuel. Capacity Remaining – Indicates the available capacity of the player’s boat. Once full, the player will be unable to catch any more fish and/or crab and will have to return to port. Health Meters – Indicates how much damage is currently associated with a player’s boat, skiff, and net. If any one of these pieces of equipment are damaged, you will have to return to your workshop at the port to get them fixed. Sonar – Indicates where the fish are! Green blips show fish in the area. As the sonar gets upgraded it will give more accurate information about where players can find the biggest haul. Crab Pot Button – clicking this button drops crab pots in the boat’s current location. The number associated with this button indicates how many crab pots are remaining on the boat. Boat upgrades allow for a larger capacity of crab pots on board. Fishing – When the sonar shows action it’s time to fish! From the Sea Screen hover over the boat and click ‘fish here.’ The object is to use your skiff to surround a school of fish and return to the hot spot on the back of the main boat. The challenge? To do this without accidentally netting a whale or an iceberg, leading to damage and fines. To move the skiff, click on the spot on the ocean where you would like the skiff to go and continue clicking until you are back to where you started. Be patient and the fish will make their way into your nets, but be sure not to run over your net with the skiff or run your skiff into the back of your main boat. Collecting Crab Pots – Players can drop crab pots from the Sea Screen by clicking on the Crab Pot button at any time. When crab pots are first put in the water they will be just for the player who placed them and will be invisible to all other players. After ten minutes, the pots will be ready to collect and will turn green. To keep track of crab pots, players can view their location via their Map Screen. Stealing Crab Pots – When crab pots are ready to be picked up (turn green) they can be stolen by any other player. If a player tries to steal a crab pot while the owner of the crab pot is visible on the screen, then the player stealing the pot will be fined and they will not be able to take the crab from that pot. Crab pots are not kept in the boat when they are stolen; they are simply emptied of crabs so therefore they don’t affect the number of crab pots a player has on their boat. Headquarters – The HQ is the central building of the port. In order to upgrade any other buildings to the next level, the HQ must be upgraded first. Crew House – The Crew House holds the crew for your boat. If a player wants to upgrade their boat, they must first upgrade the crew house to man the new ship. Each higher level of boat requires more men to man it. Fish Processing Plant – This is where a player’s catch is processed. Upgrading the fish processing plant allows for faster processing times, thereby reducing the wait to process the next catch. 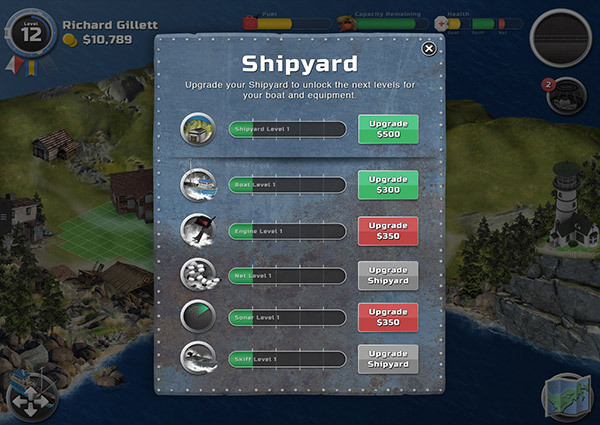 Shipyard – The shipyard is where a player can control all upgrades for their boat, including the boat itself, the sonar, the net, and the skiff. In order to upgrade any boat equipment, the shipyard must be upgraded first and the equipment can only be upgraded to the current level of the building. Workshop – The workshop is where players can go to repair damaged equipment, including the ship, the skiff, and the net. Upgrading the workshop allows for this equipment to be repaired in less time. 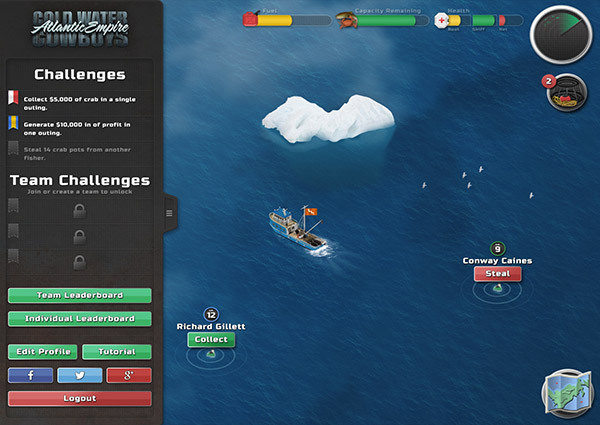 Atlantic Empire presents the player with several Challenges, which can be viewed by opening the side menu. Players must complete three unique challenges at each level in order to upgrade to the following level. Challenges can be confined to a single outing or can be cumulative, which can include catching certain amounts of fish, collecting crab, and stealing crab from other players. Certain player levels are required to upgrade equipment. Challenges increase in difficulty as they increase in number. Additionally, you and your friends can band together and rule the sea by building a team. As the captain, it will cost you $40,000 to create a team and you can decide if it will be open to the public to join or private so you control who you invite through Facebook onto your team. To create a team, simply go to the Team Leaderboard on the side menu and click Create Team. If you pay to create the team, you get the perk of deciding who stays and who gets kicked out. If you do not want to fork over the ‘money’ to run the team, you can simply join a public team from the Team Leaderboard. Being the team with the highest cumulative amount of money gets you on the top of the leaderboard where everyone can see. Soon you will be able to complete challenges on the side menu as a team to earn the big bucks. The leaderboard indicates the players who currently have collected the largest amounts of money through fishing and crabbing. Leaderboards are split into two categories: individual and team. Individual leaderboards show which player leads in terms of collected money, while the team leaderboard shows the cumulative total for all players who are part of a specific team. Cold Water Cowboys is produced with the participation of the Bell Broadcast and New Media Fund and Canada Media Fund. This entry was posted on Friday, March 6th, 2015 at 11:52 am and is filed under Educational, Everyone, National News, New Releases, RTS, Simulations. You can follow any responses to this entry through the RSS 2.0 feed. You can leave a response, or trackback from your own site.